The Shao Shan 4 (SS4 improved) electric locomotive is one of the most powerful DC electric locomotives in China. Manufacturing began in the mid 1980's and the locomotives are widely used throughout most of China's electrifried railways to this day. Prior to the Chinese AC electric era, the SS4 was the predominant power on the Datong - Qinhuangdao coal heavy haul railway. Comprised of A and B units, SS4s continue to operate between Shanxi coal mines and the Qinhuangdao coal port, sometimes in quadruple with up to 20,000t and over 200 C80 wagons in tow. 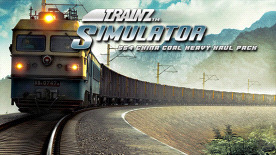 Requires the base game Trainz™ Simulator 12 on Steam in order to play.